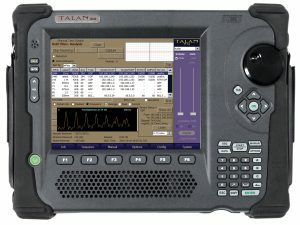 The TALAN Telephone and Line Analyzer provides many automated tests in a single product to detect and locate illicit surveillance devices (wiretaps and electronic surveillance/eavesdropping products) on telephones, communication and other types of wiring, and is the only product of its kind in existence. Developing technologies and growing acceptance of VoIP telephones have also brought increased opportunity for exploitation. A VoIP phone can be programmed to pass VoIP data, even when it appears inactive; for example, a VoIP phone can be compromised by someone with network access (e.g. IT personnel, hacker) and the ability to turn the microphone on and off, effectively collecting and transmitting room audio undetected. 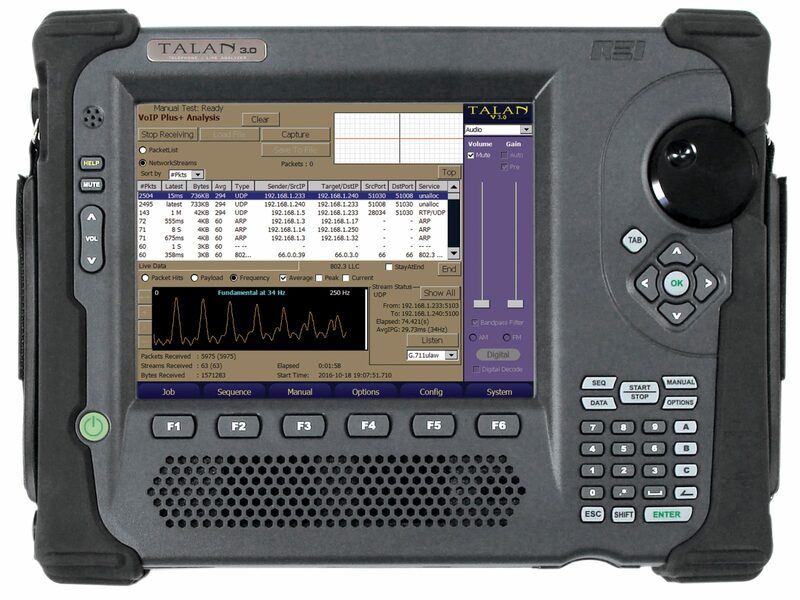 TALAN 3.0s built-in VoIP Plus+ function performs on-board tests and analysis when connected to an Ethernet network, and determines if the packet traffic has VoIP characteristics. VoIP Plus+ differentiates data generated by a VoIP phone from other network traffic using a patent pending FFT (Fourier Free Transform) algorithm that translates signal activity form the time domain to the frequency domain. VoIP data has a unique frequency pattern that distinguishes it from other network traffic and is displayed in a frequency chart. Comparison between VoIP packet traffic and other IP traffic. 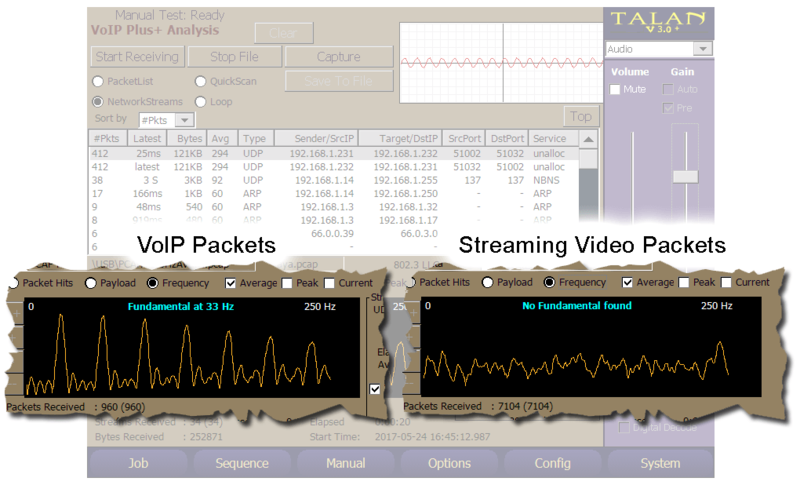 The graph on the left shows distinct frequency patterns typical to VoIP, while the more erratic frequency chart on the right represents packet traffic from streaming video. Packet data captured by the TALAN 3.0 can be saved to USB for later analysis or played back on the TALAN, the TALAN Data Viewer PC software, or in other software programs that support .cap/.pcap file formats. VoIP data collected by the TALAN includes source and destination MAC/IP addresses, header type, statistics – total packets, packet rate, peak rate, and run time. The TALAN 3.0 software can detect older protocols that other equipment may miss, increasing your probability of detection. A new input panel on TALAN 3.0 allows testing of shielded CAT6 cables, earth/ground and power over Ethernet in addition to the all original TALAN’s tests. TALAN 3.0 tests pairs within standard RJ45 cables, phone cables, lines, etc. against the foil shield that wraps around newer CAT5/6 cables to protect against interference and conductive coupling. Just like before, with 8 conductors cables, the TALAN can also test the 8 cable conductors against the shielding and against an earth/ground conductor, automatically switching through each pair combination in a single pass, or continuously. The types of tests include DMM (Digital Multi-meter – VDC, VAC, Resistance, Capacitance); FDR (Frequency Domain Reflectometer); NLJD (Non-Linear Junction Detector); RF; and Audio. Older model TALANs can be converted to TALAN 3.0 but will require hardware changes. Price quotes are available by filling out the form here.